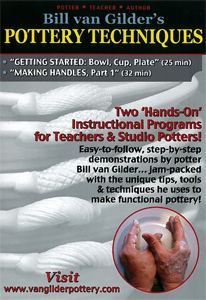 Throughout this informative Two DVD series, Bill van Gilder presents a common sense approach to teaching and learning the techniques of making hand-built and wheel-thrown pottery. Each lesson program - 2 per DVD - is designed and presented for all skill levels in an easy-to-follow, step-by-step format. Ideal for classroom teachers, students, and studio potters alike.